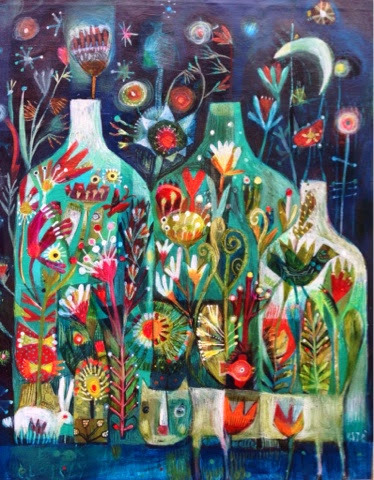 Este's Blog: 'Look Closely' New Painting now available as print. hi here is fine, it will go into the fb draw! 14 on first close look. I could keep finding more and more in this intriguing firefly night-time. There are creatures hovering in the background and peeping out between plants. Sometimes the darker dots in the colourful circles look like eyes - is it a flower or a puffer fish, a mole or a lion?! ha ha, good that you use your imagination but they must be clearly visable, paws, claws, fins beeks eyes and snouts or tiny leggs (insects) there are lots of decoys, but never mind, you are in the draw. 6 obvious. Hard to decide if some of the "glowing" objects are actually fireflies. I counted at least ten including the cat, bunny, fish, butterfly, fireflies, birds and so on and I already have a place set aside for the print, so please just send it along to me? i count six, but there are probably some hiding behind flowers. Wow! What an amazing artwork. Congratulations Este! This is something you could easily spend hours looking at. There is so much to investigate. The colors you have chosen are simply brilliant. As to how many animals and insects there are hiding ....well, I could go on counting for ages. I found 6 that were easy to find, after that there are many hiding, giving just a glimpse of possibilities. I did find 4 fireflies or are there 7 there? However many there are, this is so lovely. thanks jann yes that is about right, many decoys, thanks for your interest! I, too, found six obvious ones. I didn't count the "fireflies" as they might have been stars, didn't count the puffer fish" as it might have been a flower and didn't count other possibles as they weren't obvious. 6 I believe fantastic print! Would look great in my elementary library!